Happy New Year! 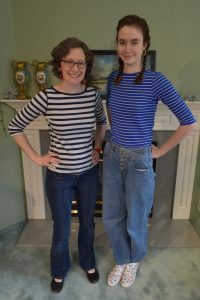 Lindee and I celebrated by going “back in time” for a vintage fashion challenge! This time, we traveled to the 1990’s to try on pants! (Yes, I know. Those of us who experienced the 90’s first hand are internally groaning.) However, we can blame Lindee and the fates for this one. Earlier in the fall, she had mentioned that she was searching for high-waisted 90’s-style pants. I almost immediately found a pair at my local thrift store. Previous to this, Lindee had been gifted a pair of leather pants from a fabulous family friend. (These, of course, HAD to be featured in the blog.) A month or so after that, I discovered some awesome, wide-legged gaucho jeans at a rummage sale. (The jeans didn’t fit me, but that’s why I have a little sister.) To round things off, I hunted obsessively until I found some Levi’s “flare” jeans, obviously from our featured decade. The “90’s Pants Challenge” was ON! When the time came for our “photo shoot,” I was of the opinion that we should minimize the “90’s-ness” and try to create looks that harkened back to the 1940’s-60’s. Lindee said no, we just had to embrace the 90’s. After discovering some shocking similarities in our wardrobes, we found a middle ground. Stripes ahoy! 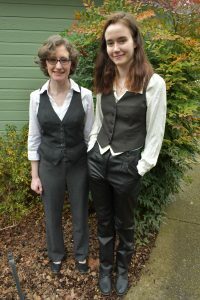 Although both pants fit awkwardly in the waists, due to either a lack of belt loops or non-functioning belts, we agreed the pants were super comfy. (An addition of elastic in the waistbands did the trick.) Next up- 90’s men’s wear! This gave us a great excuse to wear our vintage vests! 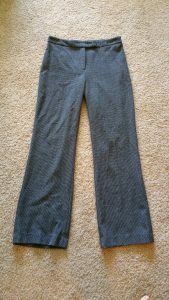 I also really liked my pants, since they had a high waist, wide legs, and a little stretch to the fabric. Lindee’s leather pants fit shockingly well, although she couldn’t see them becoming an everyday look for her. 😉 We are already planning more “fashion challenges” for this new year! Stay tuned, and keep crafting!